Surgical options for symptomatic arachnoid cysts include cyst fenestration, either open or endoscopic, insertion of a cysto-peritoneal shunt or marsupialization via a craniotomy. The merits of each technique continue to be the subject of much debate. , Recent studies have shown areas of hypoperfusion related to patients with "asymptomatic" arachnoid cysts suggesting that these lesions may also require surgical intervention. We report a case where a large arachnoid cyst was treated by marsupialization and was complicated by remote intraparenchymal hemorrhage and a spinal subdural hematoma. A 6-year-old, otherwise healthy boy, presented with a chronic history of generalized headache, which had persisted despite strong analgesia. The headaches were worse in the morning with no associated features. Neurological examination was normal. 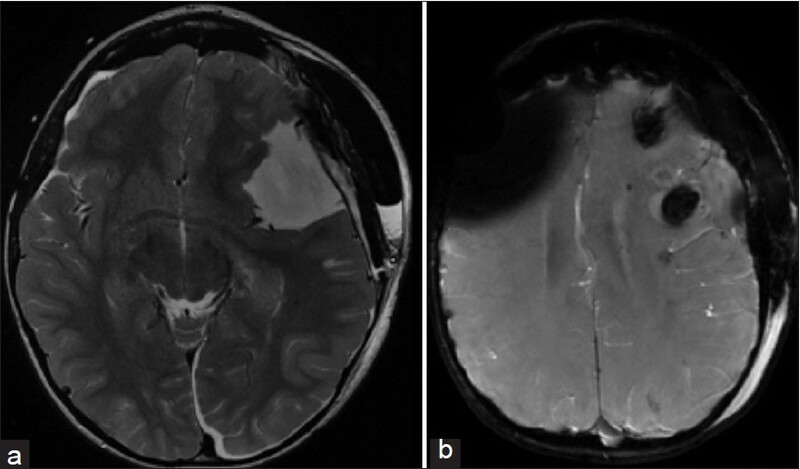 1.5 T MR imaging (GE medical systems, Milwaukee, USA) revealed a large left temporal arachnoid cyst causing mass effect with effacement of the left lateral ventricle, remodeling of the inner table of the calvarium, and mid-line shift [Figure 1]. Two smaller arachnoid cysts in the left parietal and right temporal regions were also noted. After a lengthy discussion with the family detailing the merits and disadvantages of the various treatment options, the patient was admitted for marsupialization of the large cyst. The patient underwent an uneventful left-sided craniotomy and marsupialization of the cyst. Initial fenestration revealed the fluid to be under pressure. Larger than usual cortical veins were noted postero-medially and were not disturbed during surgery. Hemostasis was satisfactory and there were no untoward surgical or anesthetic issues. A subgaleal suction drain was inserted after closure of the dura was carried out. In the post-operative suite, the patient initially moved all four limbs equally and responded appropriately. At 1-h post-procedure, he dropped his conscious level and was flexing to pain with no verbal response and was not eye opening to pain. He was therefore intubated and ventilated. The drainage bag contained 200 ml of blood-stained fluid and the drain was then clamped. Immediate axial computed tomography (CT) scan revealed significant decompression of the left middle cranial fossa arachnoid cyst and improvement in the degree of midline shift. [Figure 2] Focal areas of parenchymal hemorrhage were noted distant from the site of surgery in the left frontal lobe and left cerebellum. An intracranial pressure (ICP) monitor, inserted via a standard right frontal approach revealed the pressure to be 6 mmHg. The patient remained well sedated with an aim to keep the ICP and cerebral perfusion pressure within normal limits. Low dose dexamethasone and phenytoin were commenced. 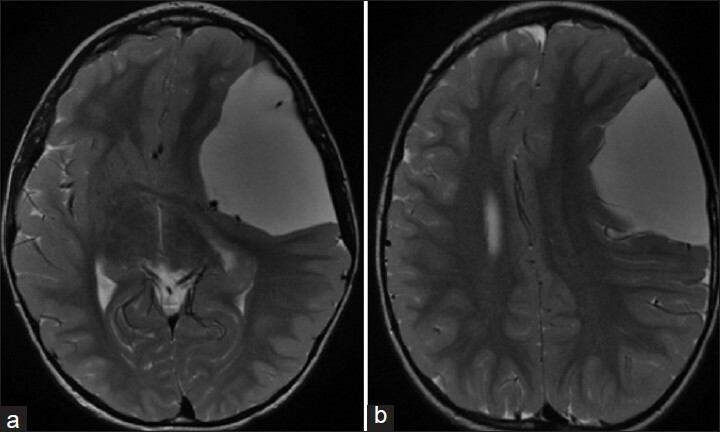 Magnetic resonance imaging (MRI) head at 18 h revealed a reduction in size of the left arachnoid cyst but also confirmed hemorrhage in the left frontal lobe and left cerebellar hemisphere [Figure 3]. There was no evidence of ischemic change on either the DWI or perfusion imaging. The patient was managed post-operatively in the intensive care unit (ICU) and gradually weaned from the ventilator over the following week. Neurological examination confirmed a right-sided upper limb and bilateral lower limb weakness (MRC grade 4/5) with intact sensation and reflexes. CT head on day 8 revealed bi-frontal subdural collections and an extra-axial collection just beneath the bone flap. The wound was clean and there was no indication to suggest an underlying infection. He was once again managed expectantly. His power improved over the next 48 h.
On day 10, he was noted to have difficulty in commencing micturition. 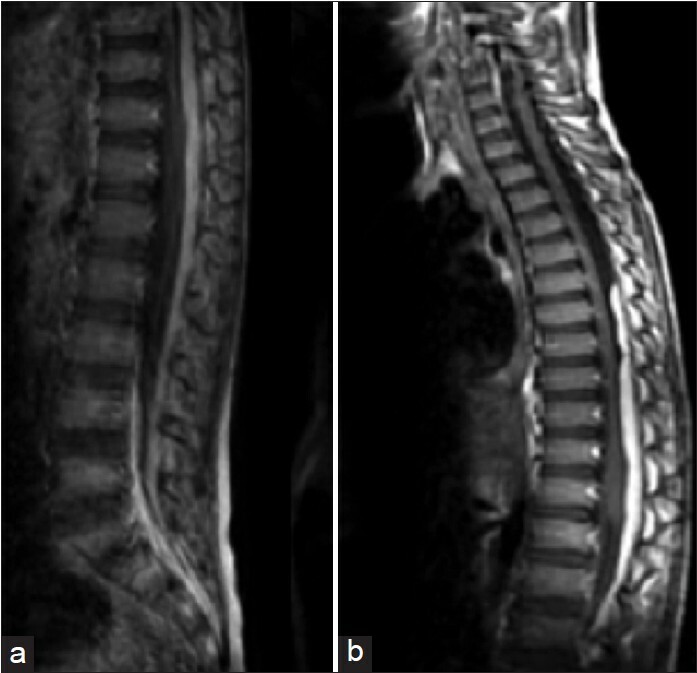 Subsequent MR spine [Figure 4] revealed a subdural hematoma from the mid-thoracic region to the sacrum. He continued to improve with respect to the power in his lower limbs and the subdural hematoma was thereby managed conservatively. At 4 weeks post-operatively, the patient's bladder function, along with limb power, had returned to normal. He was seen in outpatients at 10 weeks post-operatively and his headaches had resolved and he was at school performing normal activities. Our patient had a large arachnoid cyst and may have had chronic impairment of his autoregulation response. After excision of an arteriovenous malformation (AVM), hyperperfusion to the adjacent weakened capillary beds resulting in hemorrhage has been described previously. The rapid decompression from the craniotomy could have led to a rapid rise in cerebral perfusion causing damage to the capillary bed and resulting in parenchymal injury. Changes in the intracranial dynamics due to "brain shift" can cause venous hyperemia. In our patient, the potentially rapid loss of cerebrospinal fluid (CSF) may have led to "brain shift" and thus potentially cause the sites of hemorrhage noted distant from our operative site. The suction drain may also have contributed to this phenomenon. The changes in venous and CSF pressures causing the intracranial complications would equally be attributable to the hemorrhage seen in the spine. Spinal subdural hematomas in children are usually associated with spinal puncture and non-accidental injury and/or in the presence of coagulation abnormalities,  none of which was the case in our patient. Brain shift and hyperemic states have previously been reported after evacuation of intracranial lesions. ,, However, we believe that this is the first case of a spinal subdural hematoma as a complication from decompression of an intracranial arachnoid cyst. Rapid arachnoid cyst decompression can lead to both intracranial vascular and pressure changes. The subsequent brain shift may lead to a hyperperfusion injury. Whilst we recognize that a craniotomy may provide the best long-term outcome for treating arachnoid cysts,  more gradual decompression with programmable shunts or even endoscopic fenestration of the cyst into an adjacent basal cistern may be a safer approach. The use of a suction drain should be avoided in these cases even in the presence of macroscopic watertight closure of the dura. 1. Morris Z, Whiteley WN, Longstreth WT Jr, Weber F, Lee YC, Tsushima Y, et al. Incidental findings on brain magnetic resonance imaging: Systematic review and meta-analysis. BMJ 2009;339:b3016. 2. Pradilla G, Jallo G. Arachnoid cysts: Case series and review of the literature. Neurosurg Focus 2007;15:22:E7. 3. Shim KW, Lee YH, Park EK, Park YS, Choi JU, Kim DS. Treatment options for arachnoid cysts. Childs Nerv Syst 2009;25:1459-66. 4. Sgouros S, Chapman S. Congenital middle fossa arachnoid cysts may cause global brain ischaemia: A study with 99Tc-hexamethylpropyleneamineoxime single photon emission computerized tomography scans. Pediatr Neurosurg 2001;35:188-94. 5. Sekhon LH, Morgan MK, Spence I. Normal perfusion pressure breakthrough: The role of capillaries. J Neurosurg 1997;86:519-24. 6. Esmaeeli B, Eftekhar B. Intraparenchymal hemorrhage after surgical decompression of a Sylvian fissure arachnoid cyst. Neurol India 2006;54:320-1. 7. Domenicucci M, Ramieri A, Ciappetta P, Delfini R. Nontraumatic acute spinal subdural hematoma: Report of five cases and review of the literature. J Neurosurg 1999;91(1 Suppl):65-73. 8. Ogasawara K, Koshu K, Yoshimoto T, Ogawa A. Transient hyperemia immediately after rapid decompression of chronic subdural hematoma. Neurosurgery 1999;45:484-8. 9. Mori H, Terabayashi T, Kitazawa T, Sugiyama Y. [Multiple intracerebral hemorrhages immediately after surgical excision of middle fossa arachnoid cysts and evacuation of chronic subdural hygroma. Case report]. Neurol Med Chir (Tokyo) 1989;29:142-5. 10. Helland CA, Wester K. A population-based study of intracranial arachnoid cysts: Clinical and neuroimaging outcomes following surgical cyst decompression in children. J Neurosurg 2006;105(5 Suppl):385-90.